One trip to Costco equals 6 quick-and-simple meals ready to serve to my family on those busy night. We have even been known to create these same meals while vacationing as a family. 1. Chicken/Cheese Quesadillas – We purchase the Kirkland pre-cooked, grilled chicken breast. It comes in a 2 pack in the deli/refrigerated food section. I sauté the chicken in taco seasoning , then place it on flour tortillas with shredded cheese. Then grill it in a frying pan or griddle to melt the cheese and chicken. Serve with salad, chips, salsa and fresh fruit. 2. BBQ Beef sandwiches – The BBQ beef comes already in its own sauce. You can find this 2-pack (box) in the deli/refrigerated section. We heat up the BBQ beef then place on toasted hoagie rolls. Serve with either fries or chips and some fresh fruit. 3. Rotisserie Chicken – You purchase this fully cooked chicken already hot and ready to eat. Serve with salad and mashed potatoes (instant to keep it simple). 4. Pizza – The easiest $9.99 meal. They are HUGE. 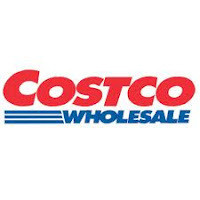 Do you have a simple COSTCO meal your family loves? Comment and share it with the 24/7 MOMS. Ready to begin the fall decorating and celebrating? 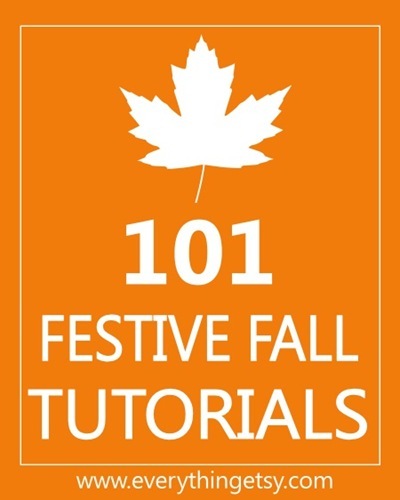 Here are 101 Festive Fall tutorials and how to's from a variety of bloggers sharing their ideas on everything from home decor to table settings. 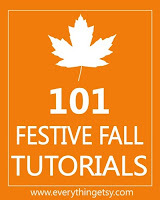 Check out all the ideas and get ready for Fall click here to go to Everything Etsy blog and see all 101 ideas. National Family Pajama Night. One Night, Many Memories! These days, it seems like families are being pulled in a thousand different directions. Between jobs, managing the household and chauffeuring kids to out-of-home activities, it’s easy to lose track of the importance of spending quality time together. The Company Store, a home and lifestyle brand now celebrating their 100th anniversary, is kicking off National Family Pajama Night™, a fantastic cause-marketing campaign. Slated for the evening of Saturday, November 19th, 2011, National Family Pajama Night™ is aimed at helping families create a fun-filled evening at home doing unique activities that create special memories for the children. 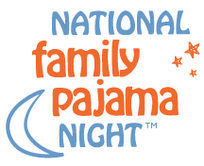 Click here to visit National Family Pajama Night's website and pledge your participation, read about fun “memory maker” ideas and post your own unique ideas for the big night. They even have a video of cute kids saying what they’d like to do on “pj night”. And once The Company Store reaches their goal of 20,000 pledges, they will make a donation of $20,000 worth of PJs from their new collection to Pajama Program, a not-for-profit organization that provides new pajamas and books to children in need in the United States. Click here to Like The Company Store on Faceboook. There will be a community tab for the campaign where parents can post their own unique, fun ideas or comment on other submissions. WIN: 24/7 MOMS and The Company Store are giving away a $50 Gift Card to The Company Store. US entries only and one entry per person. Winner will be chosen on November 12, 2011. * We received a complimentary The Company Store $50 Gift Card for review no financial compensation was received. Q: What was one of your most frightening moments? Q: What do skeletons say at the front door? 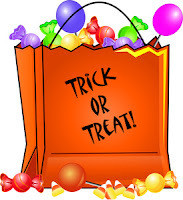 To Celebrate or Not To Celebrate Halloween? Today I stumbled across this article over at Christianity Today - "Why Christians should embrace the devilish holiday with gusto—and laughter." written by Anderson M. Rearick III. I grew up celebrating this big candy fest and enjoyed the many years of dressing up only to continue this same tradition with my own children, but always wondering in the back of my head should I or should I not be participating in a celebration that is often considered the Devils holiday - Today I can only say I'm ready to enjoy this years Halloween celebrations with complete laughter and joy. If you want to know why - Click here to read this article and you too will be filled with laughter. With Thanksgiving just a little over three weeks away I'm beginning to think of ways to help my family take notice of the many blessings God has given our family. I came across this simple Blessing Wipe off board that could be used year after year resulting in a new Thanksgiving tradition For full how to instructions go to Less -Than- Perfect Life Of Bliss by clicking here. Create Your Own family list of things you are thankful and begin a new Thanksgiving tradition this year. Homework - Never been a big fan. I knew I needed to do it, but never once wanted to do it. I wasn’t a big fan when I was going through school. And I’m still not a fan as I’m helping my kids. and explaining why you need to close the bathroom door when we have company…I just do it. write what the difference is between wants and needs? that my guy lives in. Needs – Jesus and food. NEED IS MORE IMPORTANT THAN WANT. I’ve not been getting the grade. Google but I did get a little giggle. At just the right moment, God knows when I need a little pick me up. I need God but want to be perfect. you’ll be certain that he does need said it. Steph can be found blogging at www.encouragedinheart.org or on Facebook at Stephanie Fink or on her Facebook page Encouraged in Heart - Stephanie Fink. She loves big hair, big cups of coffee and big bear hugs. When school teacher Mrs. Q forgot her lunch one day, she had no idea she was about to embark on an odyssey to uncover the truth about public school lunches. Shocked by what her students were served, she resolved to eat school lunch for an entire year, chronicling her experience anonymously on a blog that received thousands of hits daily, and was lauded by such food activists as Mark Bittman, Jamie Oliver, and Marion Nestle. Here, Mrs. Q reveals her identity for the first time in an eye-opening account of school lunches in America. Along the way, she provides invaluable resources for parents and health advocates who wish to help reform school lunch, making this a must-read for anyone concerned about children’s health issues. Mrs. Q is a public school teacher. As the writer behind the blog FedUpwithLunch.com, she has eaten over a year’s worth of school lunches. She has received praise from food activists and has appeared in the national media. WIN: 24/7 MOMS and Chronicle Books are giving away a copy of Fed Up With Lunch book. * We received a complimentary Fed Up With Lunch book for review no financial compensation was received. Q: What's the best thing you have built or created? Q: Why did the Cyclops close his school? A: Because he only had one pupil. You know the saying "Trick Or Treat Smell My Feet Give Me Something Good To Eat....." Can you hear yourself saying it as a child as you skipped down the street. I can. Now you can print It out and add it to your Halloween festive decorating fro a great childhood memory. Lolly Jane Boutique has a FREE printable in a variety of colors to print out and are ready to frame. Click here to go to Lolly Jane now. I believe in the saying children spell love T.I.M.E. – Time playing with them, time creating memories, time listening to them, time talking with them and even time serving in volunteer opportunities all create T.I.M.E. with our kids. Here are some simple and fun ideas for spending T.I.M.E. with your kids both playing and serving together this fall. Attend local theaters and playhouses. Baking cookies – start your holiday baking. How do you spend T.I.M.E. with your kids in the Fall? The Philadelphia born filmmaker Tim Chambers takes an inspirational true story that is recorded in the annals of women’s sports for his latest feature The Mighty Macs. He writes, produces and directs the film that he describes as “the equality of dreams”. Forty years ago the cultural norms for women were still very traditional and it did not afford women the luxury of equal opportunities their male counterparts had in the world of sports. Chambers notes, “That while the most successful inspirational sports movies use the sport as a metaphor, The Mighty Macs isn’t just about basketball, but it is how a young coach, Cathy Rush, could unite a team and change a generation of young women”. Chambers, familiar with the historical account, is the perfect insider to tell their story as a Philly “home boy”, raised Catholic and his personal recollection of seeing Cathy Rush in action as a boy of ten years old. His desire to give credence to this forty year old story speaks volumes to the women who chose to pursue their dreams in spite of cultural adversity in the early 70s. Chambers not only wanted to tell of those days gone by but acknowledge the accomplishments these women made on society because they dared to break through cultural barriers. In the fall of 1971, the Immaculata all-women’s Catholic college in Philadelphia hired a new basketball coach, twenty-two year old Cathy Rush (Carla Gugino). Rush never would have dreamed that her sassy, strong, charismatic, attractive, and stylish leadership would leave an imprint on the legacy of the college or in women’s sports. The stress and strain of being the newest faculty member at the all-female college was just the beginning of Cathy’s concerns. Her first day on the job she learns that a fire destroyed the gymnasium on campus. The Mother Superior (Ellen Burstyn) tells her that there is no plan to resurrect the sport facility due to insufficient funds and gives warning that her job is on the line if she doesn’t produce. Taken back by the rude awakening of a community that showed her very little love, Cathy embraced the word creativity and leaned into her supporters. The offer from Sister Sunday (Marley Shelton) to be her assistant coach and the backing of the college nuns was her first answer to prayer. The next hurdle was to see if she had enough women to make up a team. The disastrous first practice forced Coach Rush to instigate a tough but attractive training plan rally a team together. She wanted force the players to decide if they wanted to work as a team that could dictate their destiny. Soul searching was immanent! Coach Rush taught the difference to why teams get to championships and why teams win the championships with the words: trust, believe, and unite. The inspirational journey these women embarked was history in the making and a story never to be forgotten. Immaculata All-women Catholic College was the 1st National Women’s Basketball Champions in 1972. They also won in 1973 and 1974. In 2005 the college went Co-Ed. Cathy Rush was a mentor and an inspiration to many who committed to follow their dreams. In 2008 she was inducted into the Naismith Memorial Basketball Hall of Fame. Some of her original players went on to be doctors, lawyers and teachers. Several went on to coach basketball in colleges such as St. Joseph University and in the WNBA – namely, Theresa Grentz (University of Illinois), Rene Portland (Penn State) and Marianne Stanley (Old Dominion and the WNBA). "Heaven is for real, and you are going to like it! 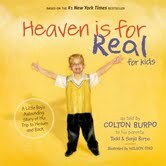 Colton Burpo came back from his trip to heaven with a very important message: Jesus really, really loves the children! In an effort to reach even more families with this eternally significant story, this runaway bestseller is now told from Colton – kid to kids! Children will receive the same comfort and assurance that so many adults have received from the trade book. Beautifully illustrated under Colton's direction, he shares his experiences in first person and comments on things that will be important to kids. A letter to parents is included to guide them as they talk to their children about heaven. Scripture along with a Q&A section with answers from the Bible are also included." WIN: 24/7 MOMS and Thomas Nelson are giving away 1 copy of Heaven is for Real for kids book. * We received a complimentary Heaven is for Real for Kids book for review no financial compensation was received. Q: What is the most adventurous or daring thing you have ever done? Q: Why don't skeletons play music in church? A: They have no organs. The Novotny family tradition began 14 years ago. I walked into my local Bible book store and there was this huge stack of shoe boxes, and next to it was a display of books titled Miracle in a Shoe Box, by Franklin Graham, founder of Operation Christmas Child. I picked up the book and skimmed through it only to discover this was the story about Operation Christmas Child in action. I was compelled from that moment to begin an annual tradition with my children, filling shoe boxes with a variety of items to be sent across the world to children who were in desperate situations. The book has since gone out of print (available online at used book sites and maybe your local library) but the tradition has continued on in my family and across the country. Will you begin a new family tradition and join the Novotny family in filling shoe boxe's? Operation Christmas Child brings joy and hope to children in desperate situations around the world through gift-filled shoe boxes and the Good News of God’s love. Since 1993, more than 61 million shoe boxes have been packed, shipped, and delivered across the globe. People of all ages can be involved in this simple, hands-on missions project while focusing on the true meaning of Christmas. Use an empty shoe box (standard size, please) or a small plastic container. You can wrap the box (lid separately), but wrapping is not required. Most importantly, pray for the child who will receive your gift. TOYS small cars, balls, dolls, stuffed animals, kazoos, harmonicas, yo-yos, jump ropes, small Etch A Sketch®, toys that light up or make noise (with extra batteries), Slinky®, etc. SCHOOL SUPPLIES pens, pencils and sharpener, crayons or markers, stamps and ink pad sets, writing pads or paper, solar calculators, coloring and picture books, etc. HYGIENE ITEMS toothbrush, toothpaste, mild bar soap (in a plastic bag), comb, washcloth, etc. Do you have an Operation Christmas Child story/tradition? 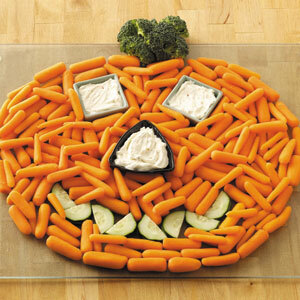 Create this last minute veggie tray to serve at your Halloween parties or take to your child's classroom for a healthy snack. Click here for complete instructions from Taste of Home. In a hurry create this simple pumpkin cookie cake with Nestle refrigerator cookie dough. Click here for complete how to instructions. 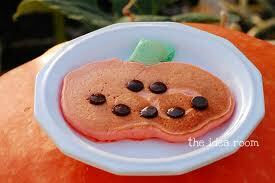 The Idea Room created a fun Halloween breakfast idea - Pumpkin flavored and shaped pancakes. Click here for complete recipe and how to. 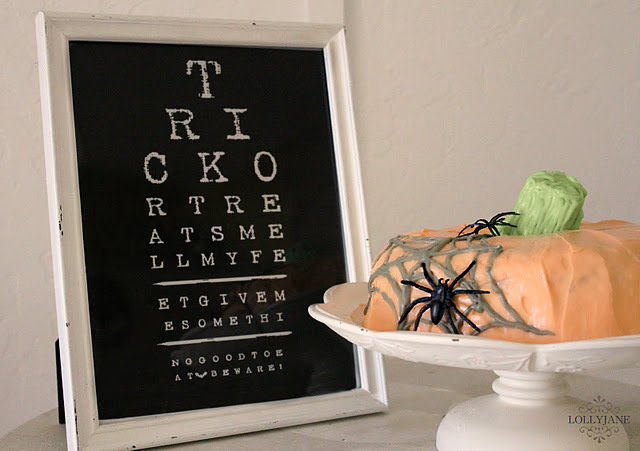 With the use of boxed cake mix, canned frosting and your bunt cake pan you can create these adorable pumpkin cake. Click here for complete instructions. Create mini clementine pumpkins in just a few minutes with this simple idea from The Princess and The Frog blog. Click here for how to instructions. 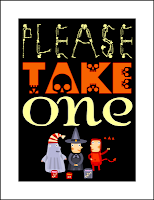 Click here to get your free "Please Take One" sign. WIN: Native Shoes is giving away 1 pair of Native shoes; either the Corrado or the Jefferson style. Winner can choose between kids or adult sizes. Click here to enter. 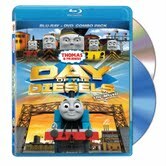 WIN: Lionsgate and HIT Entertainment are giving away a Thomas and Friends: Day of the Diesels The Movie. WIN: Lionsgate and HIT Entertainment are giving away a Angelina Ballerina: The Shining Star Trophy - The Movie. Click here to enter now. 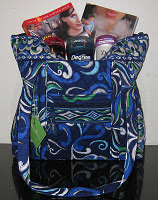 WIN: Unilever and The Motherhood are giving away a fun filled Vera Bradley bag to one of the 24/7 MOMS. The gift pack will include a Vera Bradley bag; one sample each of Dove, Degree Girl and Degree Men deodorant; and Rosalind Wiseman’s books Queen Bees and Wannabes and Boys, Girls & Other Hazardous Materials. Click here to enter. WIN: Thinkfun is giving away a HyperSwipe Game. Click here to enter. Q: Did you ever learn to swim? If so, how did you learn? Describe your experience. Q: What pants do ghosts wear? When your kids begin to tell you they need and want more Omega 3 in their diet you know it’s time as a mom to search for creative ways to incorporate Omega 3 into their diet. Yes that’s me the mom who was told by her 9 year old that he needed more Omega 3 in his diet for his heart and brain. With a variety of eaters in our home I have discovered that my daughters crepe recipe is a perfect way to get extra Omega 3 into our diets. Her crepe recipe calls for both eggs and milk and by using Horizon brand you will be including Omega 3 DHA in your crepes. An your family can even choose to fill their crepes with fillers that contain Omega 3 as well. (see list below). Crepes are easier then you think to make and your entire family will enjoy filling and eating them while getting a good dose of Omega 3 DHA. Mix all ingredients in a blender. Pour desired amount in a prepared stove top frying pan (prepared with melted butter) . Allow batter to cover entire pan to create a large round crepe. Once fully cooked on one side flip it over to finish cooling opposite side. Remove from pan fill center or crepe with assorted fillings and roll crepe style and enjoy. Are you wondering what the BIG deal about Omega 3 DHA is? Omega-3’s, also known as “good fats”, are a group of essential fatty acids. There are 3 types of omega-3’s: ALA, EPA and DHA. DHA is considered to be one of the most important of the Omega-3’s. It is a major structural fat in the brain and eyes, accounting for up to 97% of the omega-3 fats in the brain and up to 93% of the omega-3 fats in the retina. Scientists agree that DHA consumed in the diet can become available to support brain, eye and heart health. Why is DHA important for your kids? While all Omega-3’s are important, research tells us that DHA may offer the greatest number of distinct health benefits. It has been widely studied for its impact on brain and visual functioning and its role in supporting heart health. How much DHA is recommended? · DHA is found primarily in fatty fish, and many Americans, especially kids, don’t get enough of these foods to get the recommended amount of DHA in their diets. · 160 mg of DHA a day is recommended by leading health authorities for the general population. However, the average American consumes only 60-80 mg per day. · Children often have even lower intake – children ages 1-6 years old were shown to have an average DHA intake of 20 mg/day. Now - Share how you sneak Omega-3’s into your family’s diet for a chance to win a $500 Grocery Shopping Spree! This is a sponsored conversation written by me on behalf of Horizon. The opinions expressed by me do not necessarily reflect the view of the Horizon Organic brand. Deal: Get $10 off your $25 purchase of Yankee candle products at your local retailers like Bed, Bath and Beyond. Buy now for the upcoming holidays. Click here to get your coupon. 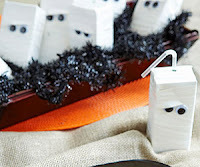 Create these fun Mummy juice boxes from this simple idea from Parents.com . 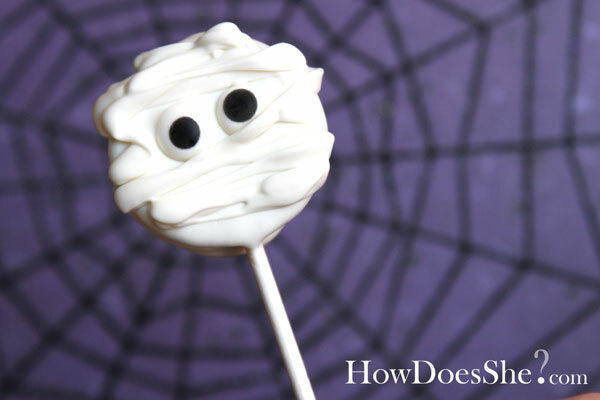 You can make an army of mummies in minutes - Click here for complete instructions. 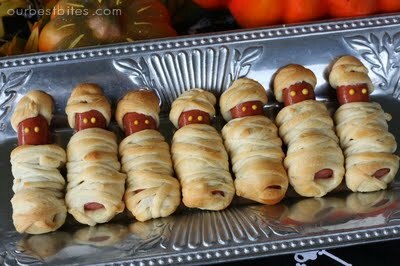 Yummy Mummy wrapped hot dogs are the perfect kid food to serve at your Halloween celebrations. Click here for full recipe and instructions from Our Best Bites. Oreos turn Mummies with this fun idea from How Does She. Click here for complete how to instructions. 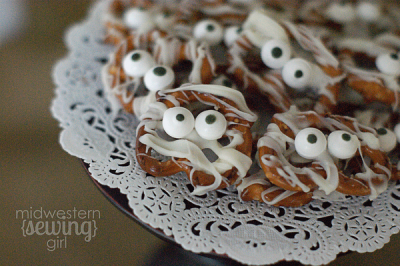 A little drizzle and added eyes creates these fun mummy pretzels thanks to Fun Family Crafts. Click here for complete recipe and how to instructions. Greeting cards can almost cost as much as the gift these days, and personally I would rather put the money toward a nicer gift than a card. I know, I know - the wonderful words written in these cards can be very meaningful. So, how do we cut back yet still share meaningful thoughts? 1. Boxed greeting card assortment – I have, over the years, purchased boxes of miscellaneous greeting cards at my local warehouse ( Costco) or Target stores. 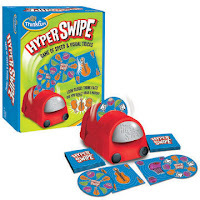 These have not only saved me money, but have saved me time when I am in a last minute situation needing a card. 2. Dollar Store Cards – Plan ahead and purchase multiple cards for upcoming birthdays, graduations, Father's day and other events you will need greeting cards for and purchase them on your next Dollar Store trip, saving you both money and time. 3. Create your own cards - using scarp book supplies, stamping kits or even right off the good ole’ computer. Click here for more information on Pampers. Click here to “Like” Pampers on Facebook. Click here to visit Let’s Rock! Elmo. (1) Hasbro’s new Let’s Rock! Elmo, who’s ready to take the stage singing and making music! Elmo comes with his very own microphone, tambourine and a drum set and sings sings six rockin’ songs. Toddlers can choose which instrument Elmo plays, and he magically recognizes which one you give him. 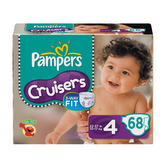 * We received a complimentary Pampers Cruisers for review no financial compensation was received. Q: How would you summarize the highs and lows of this week? Q: Who did Dracula bring to the prom? From what to wear and eat, to requests regarding where to go and what to do, moms are bombarded with tons of questions while trying to get their children out the door. Sometimes the morning routine can be complete chaos. How do we eliminate the stress and get our children off to school in peace? 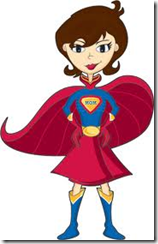 You can read my Morning Routine Organization steps over at SC Johnson Family Economics blog. Click here to read them now. 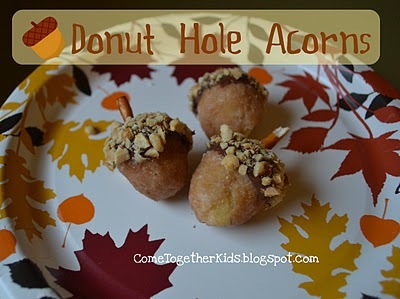 My kids enjoy donut holes as much as I do - what a fun surprise it would be to make these simple and fun Fall acorn donut hole treats this Fall. Let your kids help you make a batch to eat as a breakfast treat or bring to their classrooms during a fall celebration. Click here to get the complete how to instructions from Come Together Kid. From weekly dinners to special holiday traditions, rituals provide a foundation for family identity. Often, these rituals involve an element of gratitude and celebration of family life. Whether it is a daily or yearly practice, taking the time to be thankful offers many benefits by reducing stress and cultivating an optimistic outlook. Here are some ideas to help your family start practicing thankfulness today. Practicing gratitude daily can be a challenge when schedules get hectic, but when kept consistently, simple habits can turn into meaningful family rituals. Start small. At family dinner, have everyone share one positive thing that happened during the day — one person who made them smile or one thing for which they are thankful. 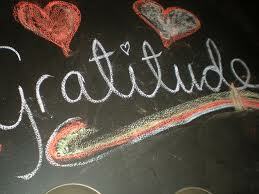 Daily gratitude is powerful. If you do not get to sit down to family dinner often enough, or if you want to extend the practice, try keeping a gratitude journal and fill it with happy memories, uplifting quotes, peaceful pictures and a list of the things that fill you with happiness. Reflect on this journal whenever you are feeling stressed or downtrodden. Reminding yourself of your successes and joys is a powerful way to lift your spirits and find a renewed sense of hope. Keeping a gratitude journal is something the whole family can enjoy. Have your children create their own journals and allow them to personalize them. Whenever they write in their journals, not only will they be honing a fundamental skill, but they will be developing a penchant for the positive. Just as in reading, writing and math, practice makes perfect in optimism as well. Keeping a journal of gratitude is a great way to reflect on the things we are thankful for in our own lives. However, often the deepest feeling of gratitude can be experienced when helping others. Volunteering is a wonderful way to give back and to gain a deep sense of perspective in your own life. Try incorporating volunteering into everyday life by working once a month at a food bank or shelter. Oftentimes, volunteer opportunities are family-friendly and are an excellent way to introduce your children to the joy and reward of giving back. For more ideas about where to volunteer, visit www.volunteermatch.org. Giving to others can be more than a yearly practice. Small, daily acts of kindness can have a huge impact, too. Whether it is paying for someone’s coffee, opening a door or helping when you see someone is in need, a little extra kindness can lead to a lot of extra gratitude in the world. For more ideas of how to practice random acts of kindness, check out the story of Robyn Bomar, who decided to complete 38 random acts of kindness in celebration of her 38th birthday: http://mixmingleglow.com/blog/?p=1358 . 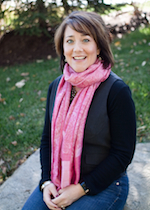 Robyn made an immense difference in her community and in her family, and so can you! By the time Friday rolls around you´re ready to leave your work at the office, save the homework for tomorrow, and unwind with a quick and easy dinner. Enjoy a classic favorite - pizza and a movie - for a Fun Friday Night with your family and friends! 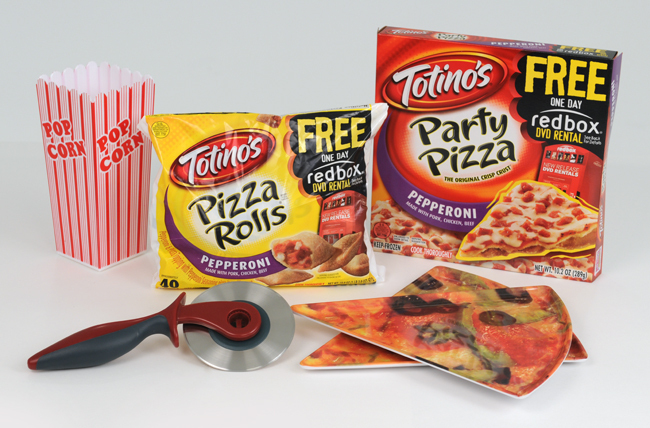 With the help of Totino´s Pizza Rolls and Party Pizzas, you can serve a convenient meal that the whole family will love and still have plenty of time to sink into the couch to watch the latest movie rental from redbox. With more than 27,800 locations, and available nationally at Walmart, there´s always a redbox kiosk nearby! Find the closest redbox kiosk by clicking here. Click here for more information on Totinos. Click here for more information on Redbox. 1. 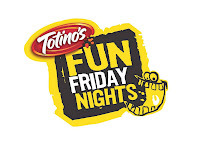 Become a 24/7 MOMS subscriber enter your email address below and comment that you subscribed along with your email address and comment how will Totino's and redbox help your family enjoy a Fun Friday night with your family? 2. 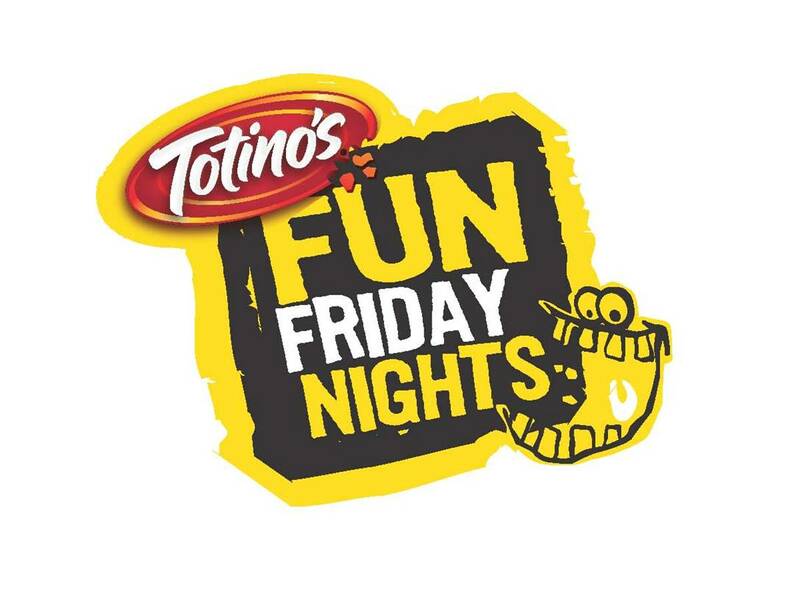 If you are already a subscriber just leave a comment that you are a subscriber along with your email address and comment how will Totino's and redbox help your family enjoy a Fun Friday night with your family? US entries only and one entry per person. Winner will be chosen on November 5, 2011. * We received a complimentary Prize Pack for review no financial compensation was received. The VIP coupons, prize pack, information, and giveaway have been provided by Totino´s through MyBlogSpark.